Sam brings me breakfast this morning - it's basically the same as yesterday apart from a different variety of breads. Once again I get a feline visitor who gladly shares the meal. 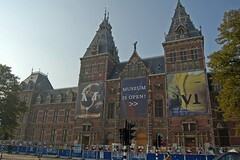 Today’s plan is to head off to the Rijksmuseum and then probably a little more touring. I’m particularly impressed by the frequency of trams. I learn from Sjaack that people are always complaining about them, in that they have to wait too long. Too long being a minute. Sheesh, they should never come to Melbourne. 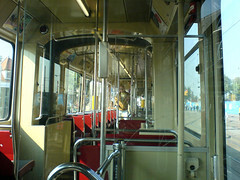 This is a typical tramstop - today I travelled on one of the older styled trams - They are narrower then ours but have plenty of seating - I really do like the tram network here - it's a great way to see the city. It's also not very crowded. I arrive a bit before 10am and there’s no queue and since it's not open yet, I take the opportunity to get some snaps of the outside. Because of the extensive renovations only the best 100 items are on display. I'm interested in seeing what they have - just before I left on this trip I managed to see an exhibition from the Rijksmuseum here in Melbourne. Due to the renovation, they have decided to lend a lot of their collection to other galleries. One of the best parts - you can take photos, just as long as you don't use flash. Unfortunately there are a lot of dingbats that use their flash anyways and claim ignorance. Do they think no-one's going to notice that great big flash? If you're that dumb and don't know how to change your camera's settings, stop taking photos and stop ruining it for the rest of us. End of lecture...for now. 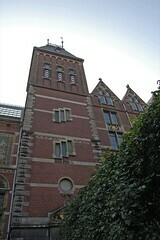 The items are divided into 14 rooms over 2 floors. There are works of art from the golden age of the Netherlands - amazing doll houses (the size of a new york bedsit! ), furniture, deftware and precious items from the treasury. 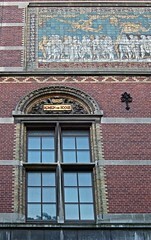 The second floor focuses on Rembrandt ("The Night Watch" is on display) and his pupils, Steen, Vermeer, Hals but also includes examples of Ceremonial plate and weaponry. I thoroughly enjoy the museum and would like to return when the renovation is complete and all the works are on display, in 2008. I finish around 11 so I take advantage of the boats ticket extension to 12 and hop on another cruise. I can't say I'm all too inspired - perhaps if I hadn't been to Brussels first then the architecture might have been more interesting. 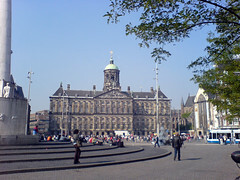 I leave the boat again at the Central Station and take the Dam tram, no, I take the tram to The Dam. 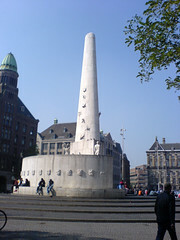 Guidebooks will tell you this is the hip, happening-centre, must-see place in the whole of Amsterdam. Yeah, if you insist. and hope the stoners don't turn their attention to you. Expecting vibrancy I found a place with a hang-over. Glassy eyed youths carting fistfulls of food desperate to feed bad cases of the munchies inhabit the neighbourhood. I wander over to the Waag (the site of a sorry market) and travel through some *cough* interesting *cough* alleys of the Red Light District. In one lane where a woman in her knickers held court in a window a few doors down one could find the Young Christian Men's Hostel. Surely it's a test of one's commitment. Perhaps it's more my own attitudes, but it's depressing. So many people off their nut just aimlessly wandering. It's not a place I feel all too safe - I certainly wouldn't be walking through here later in the day and certainly not at night. Something completely different - I found this interesting - this is how they work on the sewerage/water pipes. 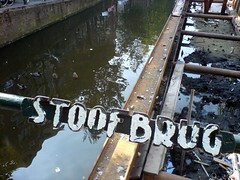 They have to partially drain the canal. Fascinating, isn't it? A late lunch is had at Metz&Co - the restaurant at the top of this department store is supposed to have a great view of the city. As I've arrived near the end of service, there's only a few tables occupied. An american couple are on a table nearby. She contemplates eating the tuna dish but upon finding out it's fresh (and raw) and not out of a can, she decides on chicken. When the same waitress comes to me I order the tuna and when she also informs me that it's basically raw, I just have to smile. 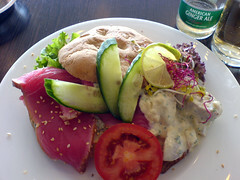 I'm very pleased when this dish is presented at the table - Seared Tuna fillet on homemade focaccia with potato salad. You can see how the searing has barely penetrated the flesh - the tuna just melted in the mouth - absolutely perfect. There aren't any photos of the view due to a haze over the city and frankly I didn't find the view that overwhelming - the food was more impressive. I also had some entertainment when the male of the american couple kept taking photos through the glass with the flash on. This should be interesting - some streets are so narrow they only have space for one tram line - this means that they have to stop and give way to trams in those sections before they can proceed - it's a bit hairy walking down this street, with the trams passing so close to you. 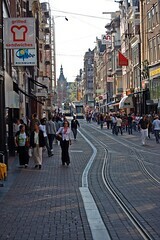 Add to that the presence of bicycles and I have to say Amsterdam is not a pedestrian friendly city. 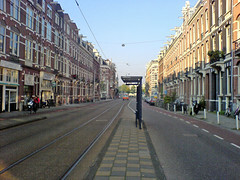 For example from the tram stop at the Van Gogh musuem you not only have to cross the road, you also have to cross two bike paths just to get to the footpath. It's nuts. In the three days here, I've lost count of the number of near-misses I've had with bikes. The riders just travel at ridiculous speeds and they travel everywhere - they don't limit themselves to roads or bike paths. At least with a car I know they should stick to the road, with the bike they can come out from anywhere. 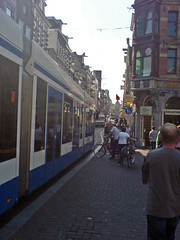 Brussels had a bit of a bike problem but Amsterdam is the pits. You can shove your pedal power where the sun don't shine. That's about it from my Amsterdam experience. How do I view the city? I think I was a little too far away from the centre of things and that may have coloured my view. 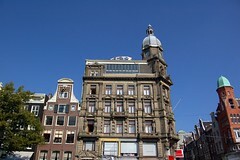 The city seems a bit lack-lustre - the red light district is depressive, there's a feeling of waste. A waste of time perhaps. 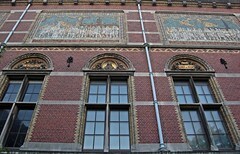 I'd return to visit the Rijksmusuem but that could be done as a day trip from Brussels. I don't know if I could justify staying in the city itself. Dirty habit, always committed by men. If you are caught the fine will be €50 to be paid immediately at the police station. Don't ruin our houses or monuments. 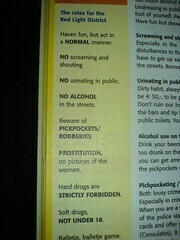 You can either go in one of the bars and tip the bartender for using the toilet or use one of the public toilets. You also can go to a police station. Interesting that there's a fine, although it's not as bad as Brussels and Paris, you can still see that tell-tale line of crotch height urine stains on the buildings. 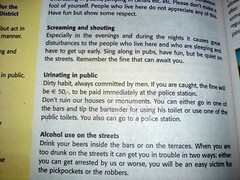 I do wonder how many people actually go to the police station to have a wee? Tomorrow morning it's a new city and a new country - I'm off to Cologne (Köln) in Germany.